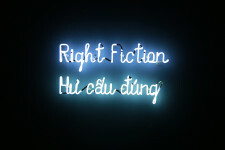 Phan Thảo Nguyên has pushed the boundaries of contemporary art in Vietnam.Through literature, philosophy and daily life, she observes ambiguous issues in social convention, history and tradition. An honours graduate from Singapore’s Lasalle College of the Arts in 2009, four years later Phan Thảo Nguyên received an MFA in Painting and Drawing from the School of the Art Institute of Chicago (SAIC).Today, in addition to her work as a multimedia artist, she has joined forces with artist Trương Công Tùng and curator Arlette Quỳnh-Anh Trần to form Art Labor. This collective explores cross-disciplinary practices and develops art projects that will benefit the local community. Phan Thảo Nguyên is expanding her “theatrical fields”, including what she calls performance gesture and moving images. Phan Thảo Nguyên has exhibited widely in Southeast Asia and is a 2016-2017 Rolex Protégée, mentored by internationally acclaimed, New York-based, performance and video artist, Joan Jonas.